This flamboyant image of a cabbage may be related to its cousins in Chardin’s last still life, …with fish, vegetables, gougères, pots and cruets, 1769, J. Paul Getty Museum, but it is also reminiscent of the more surreal cabbage in a 17th century Spanish work – Juan Sanchez Cotán (1561-1627), Still life with quince, cabbage, melon and cucumber, c.1600, San Diego Museum of Art. 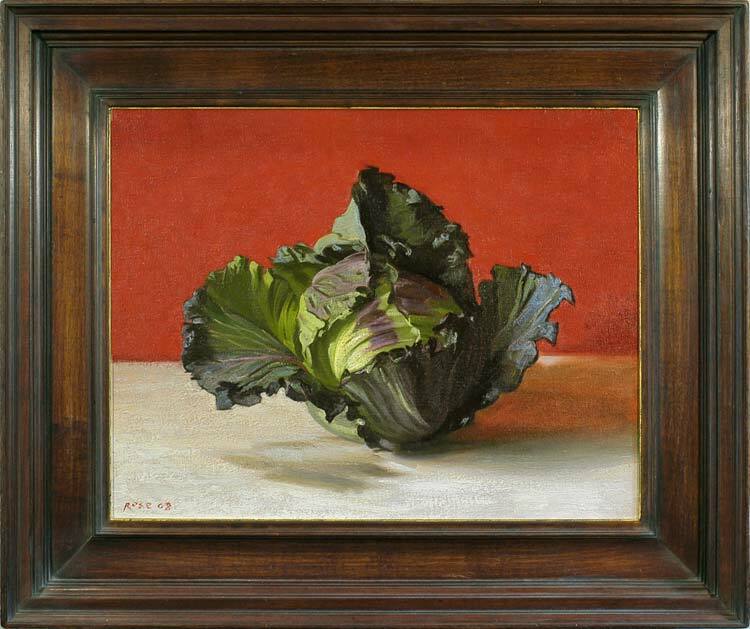 The intense focus on the flaring shape of the cabbage and the dramatic contrast of its colouring with the pulsating red of the background can be linked with Cotán’s solidly painted cabbage, strung on a thread from an integral window frame and brilliantly lit against an infinite black space. In both works the artist has transmuted a humble vegetable into a monumental form, set in a space which resists attempts to read it as having finite depth. Whilst retaining these aspects of the timeless and monumental, Rose’s painting is also extremely decorative. Stephen Rose was born in Rochford, Essex, in 1960. His career as an artist began when, aged 8, he saw a print of Caravaggio’s Conversion of St Paul. He was trained at the Medway College of Art (1979-80), Cheltenham College of Art (1980-83; BA Hons in Fine Art), the British School in Rome (1982), and the Royal Academy of Art (1983-86; Diploma in Fine Art). In 1992 he was elected Brother of the Art Workers Guild, Bloomsbury, London. He has won various awards, including the British Institute Award, 1983; the Royal Academy Painting Prize, 1984; the Landseer Scholarship, 1985; the Richard Ford Travelling Scholarship, 1986 (when he studied at the Prado, Madrid); and the Royal Overseas League International Painting Competition Travelling Prize, 1987 (when he visited in northern India). He has exhibited at the ICA, the Mall Galleries, the Royal Academy Summer Exhibition, the Royal Society of Portrait Painters and the National Portrait Gallery (BP Portrait Competition); in 2001 he had his first one-man exhibition at Target, in Munich, Germany.